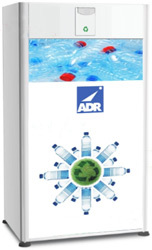 Reverse vending machines are automated machines that utilise advanced technology to identify, sort, collect and process used beverage containers. These machines accept the recyclates (bottles and cans), compacts and stores them ready for recycling. The user is rewarded with a reward voucher or money. The real time statistics are automatically aqcuired for every can or bottle received. The recycling data can be accessed by internet. 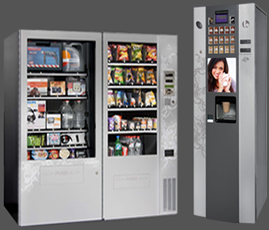 Each machine may be equipped with a monitor, which can be used for information and / or advertising. The recycler places the empty bottle/can into the receiving aperture (the horizontal in-feed system allows the user to insert containers one at a time). The bottle/can is then automatically rotated and scanned. Once a container is scanned, identified (matched to database) and determined to be a participating container, it is processed and typically crushed (for one-time-use containers) to reduce its size, to avoid spillages of liquid and to increase storage capacity. Re-fillable containers are collected and sorted by hand to be brought back to the bottling company.